Moment Pro is now across both photo and *video* including RAW and full manual controls to easily adjust exposure, ISO, shutter speed, focus, white balance, image format, and key ingredients in great mobile filmmaking like color profiles, bitrates, waveforms, RGB histograms and now both PAL and NTSC frame rates. Moment Pro Camera - DSLR camera controls, now on your phone. Free to download and try. $4.99 to unlock professional photo and (New!) advanced video features. Photographers - shoot in RAW with full manual controls to easily adjust exposure, ISO, shutter speed, focus, white balance, and image format. Now you can control the details you’re used on a dslr camera. Filmmakers - you get all the manual controls above plus color profiles, bitrates, waveform, RGB historgram, and both PAL and NTSC frame rates. Free enables you to shoot, split focus/exposure, and manually adjust exposure. + NEW: Burst mode - Capture burst shots in JPG or HEIF format. + Anamorphic - Use the Moment Anamorphic lens to shoot amazing, letterbox style photos and videos. + Apple Watch - Use your watch as a remote to shoot photos or record videos. + Split Focus and Exposure - Take control of tricky lighting scenarios. + Exposure control - Get just the right shot with a broad range of real-time exposure compensation. + HEIF and HEVC - Seamless support for the latest Apple file formats across photos and videos. + Live Histogram - Get your exposure right every time. + Auto Video Stabilization - Make your videos buttery smooth. + Moment Lens - select which lens you are shooting with. + Dual Lens Control - Manually control which side of the dual lens you want to shoot with so you can use Moment lenses over either one. + NEW: Burst mode - Capture burst shots in RAW format. This is big as now you can capture action with burst but at the uncompressed quality pros want with RAW. + Full Manual - Control ISO, shutter speed, focus, and white balance independently with easy to use sliders and double taps to reset. + Precise Video - Change your resolution and frame rate on screen, without digging into a settings menu. + Video Color Profiles - Select from default, flat, or log color profiles to get the most out of your files in post-processing. + Multiple Video Bitrates - Get precise control over video quality with standard, medium, and high bitrates to choose from. + RGB Histogram: Dial in your video color, balance, and exposure with a live RGB histogram. + Waveform monitor - Evaluate video brightness and exposure across your image in real time. + Dual-channel audio meters - Get just the right sound levels with real-time, precise, dual-channel (when available) audio levels. + Even better a Moment Photo Case - Works with the DSLR-like shutter button on our photography cases for half-press and full-press capture. Take better photos, faster. 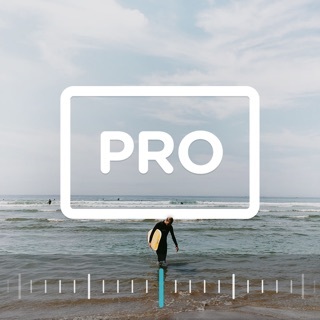 If you haven't purchased Pro yet, we have a new 7-day trial where you can try out all the features of the app for a week. Once the 7 days are over, you will not be auto-charged at the end of the trial and can decide whether or not you'd like to purchase the upgrade. + New animated tutorial on how to use some of the basic functions of the app. + Bug fixes as found by our awesome beta testers! Stopping to fiddle with your camera’s settings can sometimes mean missing out on that one-of-a-kind shot. Moment makes capturing perfect pictures and videos a snap with on-the-fly tweaks to exposure and focus accomplished by simple swipes. If too many bells and whistles in a camera app tend to befuddle you, this is definitely your Moment. For me this review is a long time coming. I have to start from beginning. My initial introduction to the company was with a kickstart project (early 2017) for the new case, battery case for iPhone 7 Plus. Which I have received promptly as they promised. Use that for about a year. And developed some issues. I believe issues were possibly with design of the connector. Basically the case would not charge anymore. I have contacted their support, and these guys are absolutely wonderful people. It is a fast response, it is a knowledgeable response, it is a helpful response. I have to THANK Phill, Erik and Erica. These are the three people I have been in contact with, I’m sure there are many more. With the first case not being able to be repaired, they simply sent me a new one, it was a quick and simple turn around. In any way case is great. Life goes on. Also purchased some of their lenses, absolutely quality product. As far as the app goes it is just as good as everything else they have done. If there is one comment to have that is not super glowing, is that they are busy people, so 24-48 hour turnaround to respond should be expected. New product launch time. But I have no problem with that. Once again, these are top notch support/engineer/sales/people absolutely wonderful team that they have. Definitely have a customer for life.